Womanisers in Ghana who die in active service can now get a befitting last moment as a carpenter in the country has just designed a peen Casket for them to be buried in. 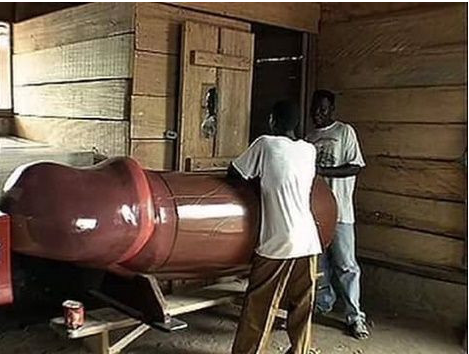 According to reports, the peen casket was specially designed by a Ghanaian coffin maker. In a photo that has gone viral on social media, the carpenter is seen standing by a coffin designed in the mould of the male reproductive organ (the peen). The said photo has created a lot of buzz on social media, with many wondering what could motivate a carpenter to make this kind of casket.